Spherexx.com develops custom market comparison application for multifamily management giant. BH Management Services, Inc. has just implemented a distinctive Comparative Market Survey product that services 133 communities located throughout 17 states with data on 1,100 comparable apartment communities. The premier application makes vital marketing information available to decision makers, owners, and managers, twenty-four-seven in multiple markets. The application developed by Spherexx.com compares pricing, space, floor plans, amenities, occupancy rates, leasing policies, features and utilities. It automatically calculates gross rent schedules, square foot rates and net effective rates (rates impacted by concession during the term of the lease). The program builds historical data and colorfully graphs occupancy and rental rates into readily discernable market trends. An apartment community can be studied in brief overview or precise detail, singularly or collectively. Marketing and administration information is easily updated through the program's administrative center so programming costs are kept at a minimum. "Our new Online Apartment Market Survey -- simplifying and securing the marketing data of today and yesterday, providing instant retrieval for graphing and reports, and allowing more time to devote to prospects, residents and clients," summarizes Drew McColgan, Marketing Director for BH Management. Management professionals maintain market data to keep their clients staged for maximum returns. Timely and accurate market surveys are essential to successfully optimize rental rates and revenue by constantly fine-tuning prices to reciprocate ever-changing demand. Market data is also a compass to determine new construction, acquisition and disposition of multifamily real estate. Precise historical market data is critical to anticipate market trends by region, portfolio, or product; and to project income, validate income analysis, and conduct due diligence. Spreadsheet programs are commonly used by many property management companies for creating market surveys. Desktop survey publishing creates vulnerabilities through version incompatibilities, possible deletion, print and format inconsistencies, and input errors. Those factors limit historical reporting capabilities and information sharing. Spherexx.com's customized program eliminates desktop hazards along with person hours spent generating, converting and distributing market data over such a large management portfolio. BH is a leader in initiating and adapting web technology to serve their investors, residents and employees. Their websites also offer online rental payment, service requests, and apartment comparison. Web developer and real estate marketing specialist Spherexx.com brought its seventy collective years of direct property management experience to play in developing BH Management's extensive market comparable program. They have provided services to other innovative real estate companies like Trammell Crow, Lincoln Property Company, Riverstone Residential, Verde Apartments, Simmons Vedder, ZOM Residential Services and Tarragon LLC. Spherexx.com's lead generation, marketing, and prospecting tools are branded under http://www.GotNoVacancy.com ™, http://www.HomeClosingTools.com ™, and http://www.MyClosingTools.com ™ . 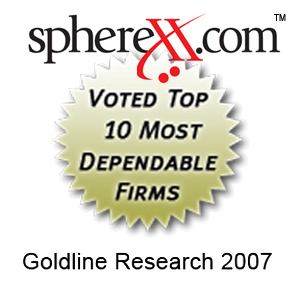 Founded in 2000 with offices in Dallas, Tulsa and Houston, http://www.Spherexx.com maintains a national footprint and serves a range of industries, although their primary focus is developing web-based prospecting, marketing, information management, and support services for the multifamily housing, financial, and real estate industries. Their innovations include dynamic websites, interactive floor plans (virtually arranging furniture in floor plans to scale), mobile marketing, interactive site plans, 3D animation tours, targeted search engine strategies for lead generation, online rental applications & integrated online rent payments. Spherexx.com also provides touch-screen kiosks, marketing services (logo design, branding, video/multimedia production, 3D animation, and copywriting) mobile marketing, website & email hosting, remote backup storage, database solutions, lead tracking & sales closing tools, pay per click, e-commerce solutions and custom programming.